Fusible Help. Do you plan to work your rooster pattern(s) using the fusible method? Don't you wish you could skip the step of tracing them in reverse? Wouldn't you love to work up the Advanced pattern rather than the Simplified pattern? Well, I have the answer for you. Pattern(s) of the month: Choose 1, 2, or 3 patterns delivered to your door. Join the Pattern of the Month program using your VISA or Mastercard. 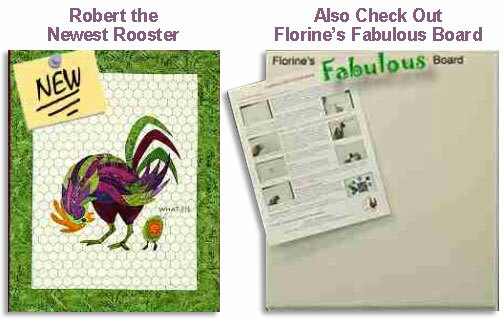 Kits with our Radical Rooster patterns can be purchased with all the fabric needed from our friends at Stitch-n-Frame. Click on their "on-line catalog" and then type "roosters" in the search box.